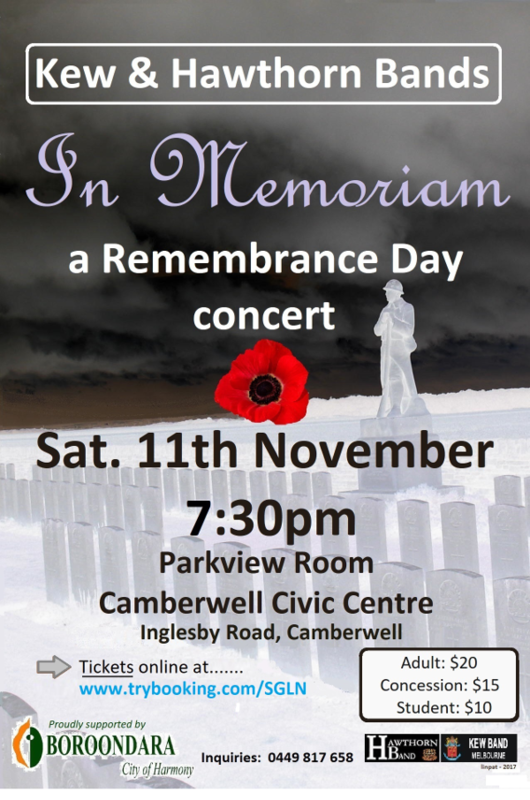 Kew Band, in conjunction with Hawthorn Band, will present In Memoriam – A Remembrance Day concert, on November 11th. Tickets are available at www.trybooking.com/SGLN. The band has a regular program of concerts scheduled throughout the year and frequently competes against other brass bands at venues around the country. The friendly, sociable and accomplished ensemble always welcomes brass and percussion players. Please contact us if you are interested in joining the band or engaging the band for a performance. Kew Band Melbourne acknowledges the generous support of our sponsors.